Well if you think that’s a mouthful to say, you’ll understand why looking at this tent. According to Heimplanet, “The Cave” tent was designed by Stefan Clauss and Stefan Schulze Diekhoff. It’s structure is supported by an inflatable skeleton, rather than rigid poles, and in the form of a geodesic shape. The tent is specifically modeled after part of the shape of a carbon molecule in the form of diamond. The Cave tent sleeps 3 and it’s inflatable diamond grid can be inflated in one single step, but divides into 5 separate compartments for redundancy and to preserve a stable stance. 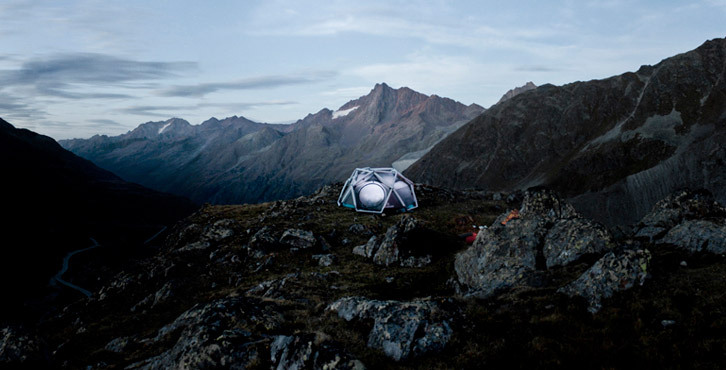 Be the first to comment on "Heimplanet “The Cave” Geodesic Inflatable Dome Tent"